Whether you're a lifelong believer, a devout atheist, or someone who remains uncertain about the role of religion in our lives, this insightful manifesto will engage you with its provocative ideas. With a close and studied reading of the major religious texts, Christopher Hitchens documents the ways in which religion is a man-made wish, a cause of dangerous sexual repression, and a distortion of our origins in the cosmos. With eloquent clarity, Hitchens frames the argument for a more secular life based on science and reason, in which hell is replaced by the Hubble Telescope's awesome view of the universe, and Moses and the burning bush give way to the beauty and symmetry of the double helix. In the tradition of Bertrand Russell's Why I Am Not a Christian and Sam Harris's The End of Faith, Christopher Hitchens makes the ultimate case against religion. Hitchens doesn't miss a single case of illustrating the horrors of the religious world and religious history. He's smart and he's a good writer, and he's documenting real cases so he kept me listening and definitely made me think about religion and its power in the world. Ultimately, though, the book would be better--and more true--if Hitchens could find a little more depth and generosity in his soul. I often got the feeling that the book was calculated to sell for its shock value. The result is a good rather than great book about religion. So much fun to listen to. My only nag is that I couldn't always understand his accent. It was long or else I'd listen to it again to pick up the parts I missed the first time through. Everyone religious or non should listen to this book. It is an intelligent review of all man-made religions. A more provocative argument you may not find. Hitchens pours it on fast and heavy in building a case for the reexamining of world religious faiths and the harm caused. This is an extremely eloquent treatise well thought out and apparently researched. Anyone of faith will most likely find most of the book unappealing and contentious in the least and an outright assault to their personal beliefs in the large. Having said that I still highly recommend this book for amongst main reasons, but mainly for the depth of the argument that lends itself to “The Emperor with no Clothes” analogy. What do we do with our traditions that, after close examination, no longer give comfort and may warp our future behavior. Hitch, nails it like only he can. So there are about 1,000 documented Gods conjured up by man and most all are an atheist w respect to all but 1? You're only 1 away!! Keep going! LOL! Oddly in my opinion, 90+% of the time, we are our the religion stamped into us by our parents? Kind of begs (answers) the question. Did God make us in His image or did many men make many Gods. But hey, I must step aside at the pearly gates to let Charles Manson on in. A Priest visited him 3 min before his death and he & God are tight now. Go figure. Thoughts to ponder and this book does it like no other. A superb dissection of the oldest con job in history. It was much appreciated to hear the book read in the author's voice. But if you want to catch every subtle point, bit of information and all his sarcastic wit, you had better pay attention and concentrate as you listen! Hitchens is so intelligent and articulate, i often wished i had a convenient pause and rewind button in the truck so i could let many of the lines sink in. He succeeds at pointing out the ridiculous contrivances of human beings, and at many points i laughed out loud at the absurdity of us, or gritted my teeth at the cruelty we often display. Regardless of your views on religion, if you are open to a well-stated argument, you will find his presentation simulataneously entertaining, eloquently stated, and informative. And boy oh boy, to a dolt like me, they sure came rapid-fire! Enjoy. Great book, fascinating read. Even though the narration was good, I feel It could been much better, he tends to lower his voice at times, making him hard to understand. Great work. 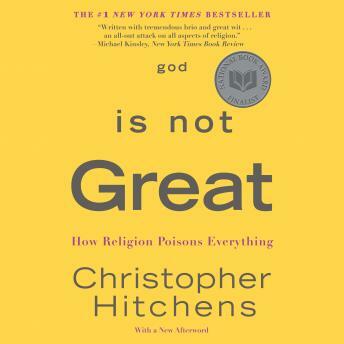 Although unappealing to most theists, Hitchens brings his unapologetic attacks on religions. He is highly educated in most facets of theology which makes his arguments much more substantial. Christopher Hitchens along with Richard Dawkins are the biggest voices for atheism and "anti-theism" currently in the world and both bring an enormous intellect to the table. For strong believers in of any religion this book will be repugnant and probably stir anger, so I wouldn't waste your time. However, if you have ever doubted your faith because there are so many unanswered questions, then this is a must read or listen. Also, I really enjoyed Hitchens' narration. Hitchins says nothing that any atheist hasn't heard before, but does have a new way of saying it. I was interested in his perspective to a degree, especially when he builds upon information delivered in Dawkins' THE GOD DELUSION. However, he should have someone else narrate his work. He randomly pauses in mid sentence, mumbles a few syllables, then bellows the next word at ear shattering decibel. Why Chris?? It was a mumbled mess of good information at times, which made it hard to listen to in a car with full attention. Hitchins delivers almost an autobiography of his opinion of religion and history of governments use of religion in their own country's past. Much of the book was redundant bore, peppered with some good quotes and argument that are now a part of my arsenal. Not bad, not great. I really wanted to listen to this book but found the narrator obnoxious within the first disk.